Ramada Grayling Michigan located at 2650 South Interstate 75 Business Loop provides easy access to all northern Michigans recreational activities such as, Skiing, Boating, Biking, Hunting, Fishing, Golf and Snowmobiling. 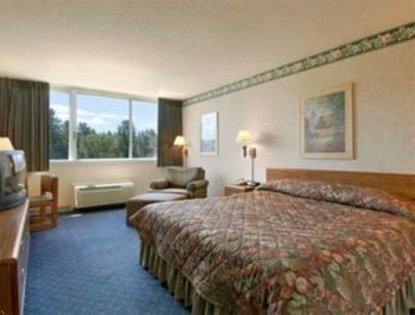 In fact, cross country ski and sled trails are only steps away from you own guest room door. Ask us about our Golf and Canoe packages. Only minutes away from world famous AuSable &amp Manistee Rivers, Hartwick Pines State Park, Camp Grayling National Guard Facilities, and one of the nations top 10 quilt shops The Ice House Quilt Shop. The Ramada Grayling features a large indoor recreation area with heated indoor pool, whirlpool, play area, game room, heated childrens pool and child play area. The 150 plus guest rooms offer the latest in comfort and amenities. 25 in. color cable TV with premium channels, coffee makers, hairdryers, iron, ironing board, FREE local calls, FREE USA Today newspaper and FREE continental breakfast, Monday thru Friday. The Crawford Station Restaurant and the Speakeasy Saloon are waiting eagerly to satisfy the most discriminating tastes in the finest of food and beverages. Our convention facilities with highly trained staff, offers full menu selections for up to 400 people, hosting any and all occasions from weddings, business meetings and even retreats. So remember, when traveling to or through, north central Michigan, make the Ramada Grayling a must stop and leave the rest to us.